Best Western® has been known for many years as the heart and soul of American hospitality and travel. 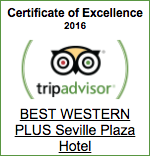 The Best Western Plus Seville Plaza is a Rider Friendly ® hotel and have wipe-down towels available. Receive a discount of 10% or more on room rates at Best Western hotels with our Harley-Davidson hotel discount program. As a H.O.G. member, you are automatically upgraded to Platinum Elite status.